It started with a song—well, a songwriter, really. During a visit to Memphis to catch a show by musician friend Chuck Ragan, Mary Lynn Schroeder found herself contemplating how a songwriter would work, scribbling lyrics in a journal. She herself was in transition from the music business to becoming a fabric artist, so when she returned home to Illinois, she made her first hand-stamped leather journal. 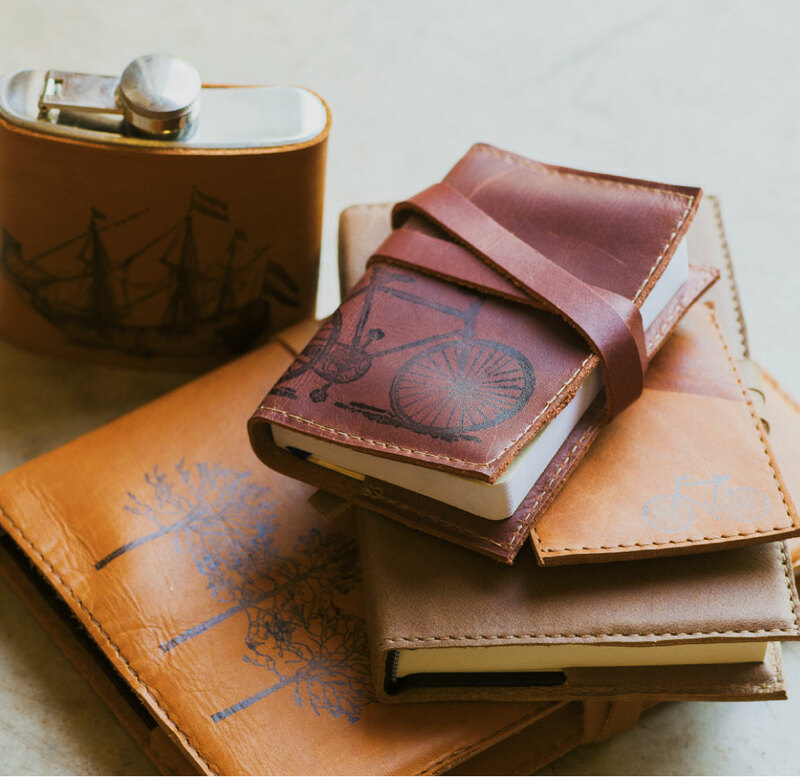 After listing the journal on Etsy, Schroeder woke the next morning to find orders for 100 more. A new business was born, and its name also came from a song: In Blue, that haunting emotion that Bob Dylan was tangled up in. Schroeder moved to Asheville in 2011, and since then, In Blue has expanded to a staff of 11 and grown by 40 percent each of the past four years. Earlier this year, In Blue received the $25,000 grand prize in the national FedEx Small Business Grant contest, and the company is expected to do $1 million in sales for 2015. Asheville, says Schroeder, turned out to be the perfect place for a music-inspired, DIY business to thrive. The leather-bound journal is still In Blue’s cornerstone product, but the company also makes leather-covered flasks, wallets, phone cases, tablet sleeves, bags, and guitar straps. From the beginning, customization was an important element: Customers can choose the stamp design and color of the leather, and opt to add words, a monogram, or personal artwork, too. Schroeder started out stamping journals with pre-made stamps, but soon contracted with stamp fabricators to come up with original designs. The company also makes custom leather goods on request, including the merch and accessories they produce for musicians, such as guitar straps for Chris Funk with The Decemberists. In Blue sells directly from its website, but about 40 percent of sales still come from Etsy, with another 40 from some 300 wholesale accounts, which Schroeder credits wholesale manager Travis Nevill with developing exponentially. “We each have different skill sets, and we work very much as a team here,” says Schroeder. Music is still an integral part of In Blue’s business, and Schroeder and media relations manager Katie Robb spend a big portion of their time manning booths at festivals around the country. The company’s music connection even inspired its Between the Lines video series featuring interviews with bands, exploring their songwriting processes. For a company named from a song, music is indeed the catalyst. In Blue leather goods can be found at inbluehandmade.com or on Etsy at www.etsy.com/shop/inblue.